The cold slate slab standing in the buttery or larder would keep the food cool and fresh. It would often have a curtain attached to the front to hide the utensils kept beneath it. 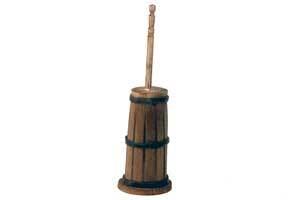 One of the earliest types of butter churn was the plunger churn. The plunger had a perforated wooden disc at the bottom. This was dashed up and down in the cream until butter was formed. A basic table on which to work and store food. Probably derived from the word pale meaning a flat strip of wood, the pail was made up of flat wooden strips bound together with iron hoops, like a barrel. A set of basic open shelves to fix on the wall and a peg board to hang goods.